Identification cable ties are available in a wide variety of lengths and strengths. The one piece construction allows for consistent performance and reliability. Identification ties enable wire and cable bundles to be fastened and identified at the same time. 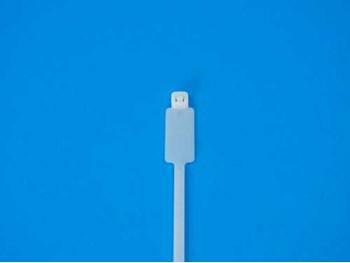 The identification feature can be either Internal with the marking portion between the head and strap of the cable tie or External with the marking portion outside the head of the cable tie. The identification feature can be either horizontal or vertical to the strap of the tie. The identification feature marking area can be marked with a marker pen or hot stamped. Serial numbers, company logos, and sequential numbers can all be imprinted on the tie. Lengths of Internal Identification cable ties range from 4” – 14” and available strengths include 18lb and 50 lbs. External Identification cable ties, also known as Flag Ties, are available in the 4” length only with an 18 lb tensile strength. The Identification cable ties are offered in Natural and UV Black. Bulk packaging of 1000 pieces per bag and smaller packaged quantities of 100 per bag are available. Tensile Strength – range from 18 lbs. – 50 lbs.